The Seedbeds of Transformation conference in South Africa, from 9-11 May 2018, provided a collaborative, trans-disciplinary space for people with diverse perspectives to explore transformations and the SDGs in Africa. CORDIO participated in the conference, to present the current status of scenarios being developed for the Northern Mozambique Channel, and initiate an SDG Lab on marine plastic waste. Art by Grant Johnson at Graphic Harvest, summarizes the mood and outcomes of the conference (see in slider). For South Africa Broadcasting Company news clips of the conference and an interview with Dr. David Obura, click here. The third and last of a series of workshops implementing a “Transformative Scenarios Process” (TSP) was held in Zanzibar in March 2018, building on prior workshops in Seychelles (May 2017) and Maputo (November 2017). 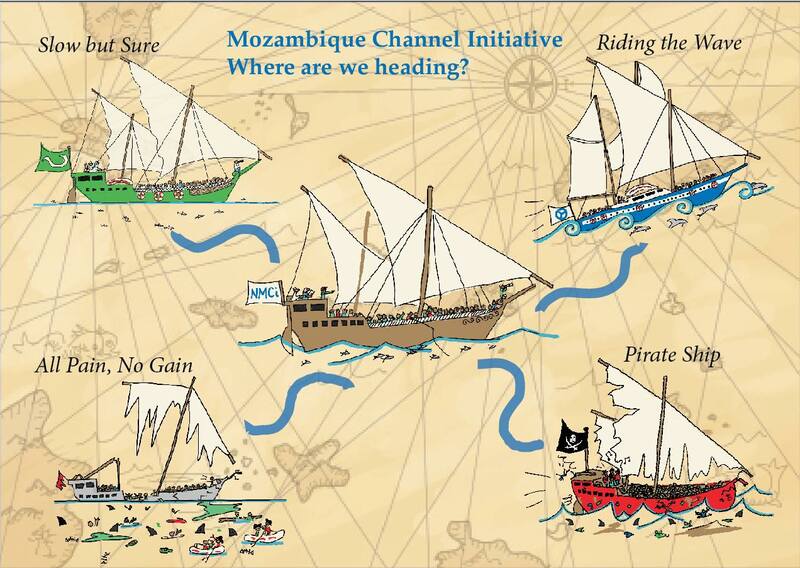 Four narratives describing imaginary trajectories from 2018 to 2035 for countries of the Northern Mozambique Channel have emerged. Participants to the TSP work identified the type of governance (good versus poor) and the level of investment (high vs. low) to be the primary uncertainties that will determine the countries’ futures. Against these, the interplay of multiple other factors – less uncertain, but nevertheless equally powerful – could influence their futures – climate change, political processes, health and education policies, etc. The conference presentation focused on some preliminary outputs, to gain feedback and insights for their final publication. The context for this SDG Lab is the rapidly growing volume of plastic waste on Kenya’s beaches (a sign of increased solid waste in creeks and the ocean) and Kenya’s recent Ministerial ban of plastic bags. The goal is to reduce plastic waste in the environment, and to use this nexus between waste and Mombasa’s beautiful beaches to promote change. Reducing beach waste is a key element in improving quality of life for city residents, improving Kenya’s image as a nature-based tourist destination and addressing one of the critical ocean health challenges. The Lab will explore how to strengthen and extend Kenya’s Ministerial plastic bag ban so that less plastic waste is released into the environment in Mombasa, more of it is collected and potentially recycled and reused, and that this transformational change extends to other types of solid (and eventually other) waste. The Lab will identify, in this key nexus between two SDG Goals and a specific target in each, what ‘working towards the SDGs’ means in an African coastal city. Lab members will identify what key issues of social change are implicated in meeting these two targets, and are tradeoffs involved? Different stakeholders will identify what actions they can take to promote a desirable outcome toward greater sustainability and equity, and will carry forward individual and group actions to prototype their effectiveness.